For my session at FITC Amsterdam 2012 I’ll be talking about making games for kids. More and more, mobile devices are allowing people to visit our websites away from the desktop. 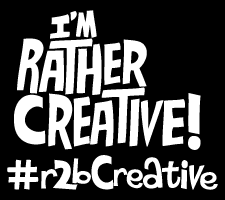 The sites that I work on chiefly consist of games (Flash) and video content (delivered via Flash). This means that mobile devices without Flash will only be able to gain access to a very small amount of content. To improve this situation we are looking at broadening our game content to include HTML5 builds. HTML5 has a great deal of promise, and in the future we will be able to achieve amazing things within the browser. But what about now? What can be achieved on the current crop of those mobiles and tablets that are available to children? To explore the development of HTML5 games, I set myself the task of building whole game prototypes with NO libraries. Here, I felt the best way for me to discover and analyse the issues was to code raw. With a target of mobile and tablet devices I figured that I’d need to hand-roll my own highly performant physics systems, and I wanted this to be fairly sophisticated. I will describe my methods with code and visual examples. Throughout the session I’ll detail my discoveries. What are the most optimal ways to achieve cross (mobile) browser game builds? How do you achieve high performance on low spec devices? How do you optimise assets? What tools are good to use? I’ll look at what we can and can’t do with HTML5 – some of the exciting possibilities and some of the game related (currently)missing features. Also, what next for the mobile technology and gaming? HTML%, Apps or the cloud? I’ll be posting the session content – game prototypes and performance tests – here on the GameLab before my FITC Amsterdam session. Or how to place a map coordinate into 3D space. This post is a brief walk through of the basics from my 2010 presentation “Where in the world? Intercontinental Ballistic Flash”. 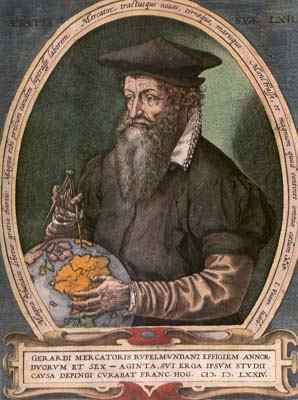 Belgian, Flemish geographer and cartographer Gerardus Mercator, in 1569 presented a cylindrical map projection. 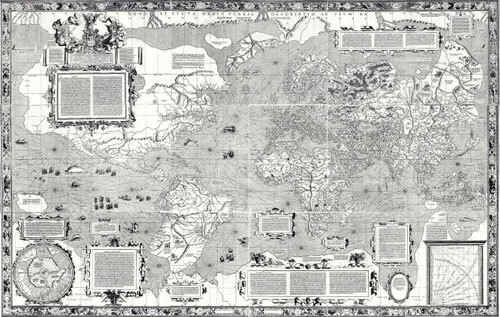 The Mercator Projection quickly became the standard map used for nautical purposes. It’s advantages were that the scale is linear in any direction around a point, meaning all angles were preserved (conformal). Around the equator feature shapes are accurately portrayed but as the poles are approached there is a size and shape distortion. The scale increases as the pole is neared, eventually becoming infinite when the pole is reached. If you imagine the world as a beach ball. The Mercator Projection is the equivalent of cutting open the ball at each pole and stretching the skin to form a cylinder. Now slice down the cylinder and you have the map. The first Mercator projected map. 1569. All map projections distort the shape or size of the Earth’s (or for that matter any other planet’s) surface. The Mercator Projection exaggerates areas far from the equator. Greenland seems as large as Africa, but is in fact 1/14 of the size, Antartica appears to be the largest continent but is in fact only 5th in terms of area. Despite the obvious distortions, the Mercator Projection makes a great interactive map. Thanks to the conformality it can be zoomed nearly seamlessly. So here we have a system that converts a 3D scene, the real world, onto a 2D plane, the map. This system can just as easily convert the 2D back to 3D. It is a coordinate system that requires two positional parameters and one constant: the planet radius. The positional parameters are latitude and longitude. As developers we are used to standard coordinates x and y. Across then up. Horizontal then vertical. With latitude and longitude we have to think differently. Latitude is vertical and longitude is across. Up then across. Latitudes run from pole to pole, while longitudes run around the planet. There are 180 degrees of latitude from the South Pole to the North pole, and 360 degrees around the planet. Imagine yourself sat at the centre of the Earth with a laser pointer. Point at the Equator then you are at 0 degrees latitude, at the South Pole -90 degrees and at the North Pole 90 degrees. Now point at the Equator again you can turn 180 degrees around the equator to the right (-180 degrees longitude) and to the left (180 degrees longitude). With these any point on the surface of the planet can be recorded or indeed any position on a map. So we have a system for calculating a position on the surface of a sphere, a 3D coordinate, but how do we convert latitude, longitude and the planet’s radius into a 3D x,y,z coordinate? Here the latitude and longitude are converted into radians ( TO_RADIANS:Number = Math.PI / 180 ). Then the trigonomic functions are applied to the planet radius to return a vector3D x,y and z.
I have been playing with the awesome Away3DLite. Playing with 1000s of polygons is very liberating, but still doesn’t mean we can slack off with the optimisation. It is important to take any opportunity to lessen the number of calculations performed per frame by the player. To this end, I was just putting together a 2D layer above my 3D scene when I found that the camera.screen function (available in the standard Away3D library) that projects 3D coordinates(x,y,z) to 2D screen positions (x,y) wasn’t present. In Away3DLite we have to calculate this ourselves. The salient information can be gained through a model or container’s viewMatrix3D property. To get an accurate screen position the the x,y,and z positions are drawn from viewMatrix3D. Each of x and y are divided by the z value and any screen offsets are applied. Pass through a screen element (a model, primitive or object container) and the 2D result will be returned. The screenW_offset and screenH_offset are required if the ‘view’ has been centred on the stage. I have put together a demo here to demonstrate the function. I load a couple of models into the scene and let a 2D info panel follow each around the screen. So you’re in Flash and want to move an item on the stage, rotate a camera or dynamically change a volume depending on another value. You could use the curves available in various Maths libraries, but you can spend a lot of time matching and applying constants. A quicker – more accurate way can be to come up with your own formulae. What!!? It is easy – you really don’t have to understand the mathematics, you can get Excel and Flash to do the heavy lifting for you. I was building a 3D application. I had a camera and needed it’s X rotation to be close to certain values depending on the camera’s position on the Z axis. I manually moved the camera into position and noted down samples of the values I required and placed them into Excel: One column for the z value and one for the required angle. – I only need a handful of samples to allow me to plot a regression trend line. I now select the values on the spreadsheet and create an XY scatter chart. Great, my points are on the graph. I can see it makes a curve. In the ‘Chart’ drop down menu I now ‘Add Trendline…’. If I choose ‘Linear’ I get a straight line, but I want a curve so I can choose from a number of different methods. In this case ‘Exponential’ seems good. Select that and a look at the Options tab allows me to select ‘Display Equation on Chart’. Now as soon as I press OK, I get my equation. Simple. As required, I have calculated the formula using the camera.z value and applied it to camera.rotationX. Now whenever the z value changes I have a smooth curve applied to rotationX. A quick addition to this post. If a more complex curve is needed then a polynomial should be chosen. A polynomial can have multiple ‘orders’. This more orders you have the more compelx the curve can be. (Excel allows up to 6). A great thing about polynomials is speed. It is merely a series of multiplications which are very light on the processor. Ranged Numbers. Non-Linear response curves for Sliders and TouchPads. I’ve been building a few apps recently and have found that a linear response over a range of numbers has been a poor solution. I needed to be able to apply different response curves to user interface components (knobs, sliders, touchpads) as well as on screen display objects, characters, etc. I needed a good name for the class, but instead came up with the pretty poor moniker ‘RangedNumbers’. I’ll change it when I come up with a better one. So the idea is, a ‘ranged number’ is instantiated, initialised for the required range then a simple call with a value in that range will result with a percentage that can be applied to the intended recipient accordingly. I realised that an inverted curve would be handy too, so have added that functionality. 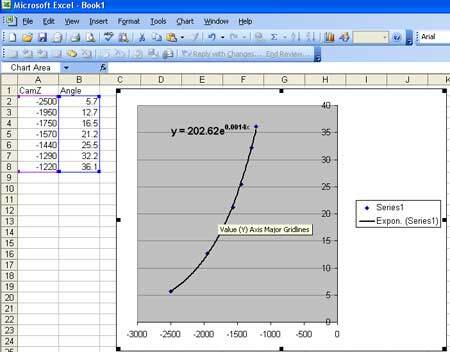 I have included exponential and powered curves as well as linear. // curve_type is the type of response curve. Firstly using a Slider component. Grab the slider and watch how the markers are represented on all the displayed response curves. Now here is the same demo but this time using a TouchPad. Click on the touchpad to engage. In this demo horizontal movement controls the standard curves and vertical the inverted.